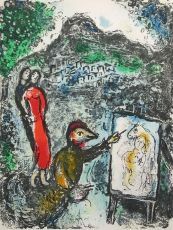 Marc Chagall (1887, Liozna, near Vitebsk (Belorussia) – 1985, Saint-Paul-de-Vence, France) was a Russian-French artist, who created paintings, stained-glass windows, ceramics, book illustrations, tapestries, prints. Though he was influenced by different styles, Cubism, Expressionism, Symbolism, Fauvism, Surrealism. he always painted in his own way. 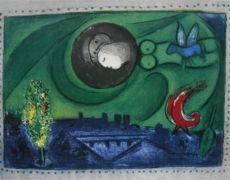 Chagall was considered to be the last survivor... Read moreMarc Chagall (1887, Liozna, near Vitebsk (Belorussia) – 1985, Saint-Paul-de-Vence, France) was a Russian-French artist, who created paintings, stained-glass windows, ceramics, book illustrations, tapestries, prints. Though he was influenced by different styles, Cubism, Expressionism, Symbolism, Fauvism, Surrealism. he always painted in his own way. 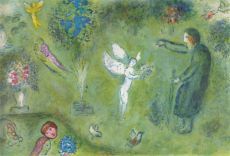 Chagall was considered to be the last survivor of the first generation of European modernists. 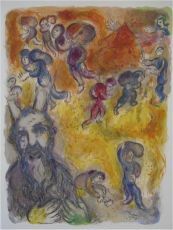 For decades, he had also been respected as the world's preeminent Jewish artist. 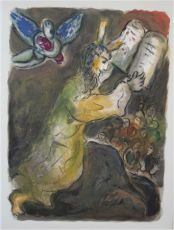 In 1906, Chagall took drawing and painting lessons from the Russian portrait artist Yehuda Pen. 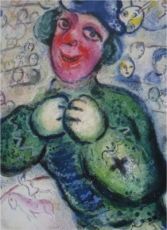 That same year Chagall moved to St. Petersburg to continue his studies at the Zvantseva School of Drawing and Painting, where he briefly was apprenticed to the artist and set designer Leon Bakst. 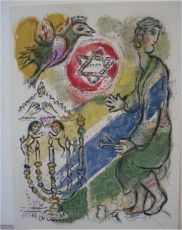 Bakst, a devout Jew himself, is believed to have encouraged Chagall to introduce Jewish imagery and themes in his work, a practice that was unpopular at that time. 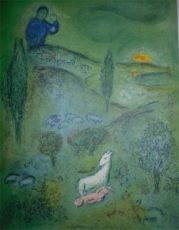 In 1910, Chagall arrived in Paris, where Cubism was emerging as the leading movement. In Paris, he exhibited in the Salon des Indépendants and in the Salon d’Automne. 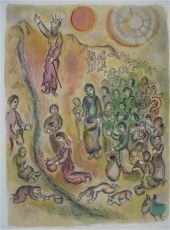 During this period he created art based on his idea of Eastern European Jewish folk culture. In 1914, he had his first so show at Der Sturm in Berlin. In 1915, he married Bella Rosenfeld, after which they moved to Petersburg. 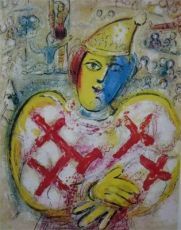 He spent the wartime years in Soviet Belarus, becoming one of the country's most distinguished artists and a member of the modernist avant-garde, founding the Vitebsk Arts College before leaving again for Paris in 1922. 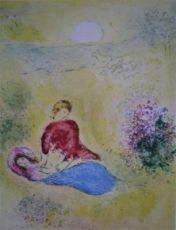 Bella died in 1944, and Chagall remarried in 1952 to Valentina Brodsky. 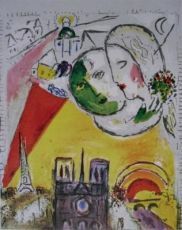 From 1957, Chagall regularly came to Reims, where he was working along with the Jacques Simon Workshop on a number of important projects in France and internationally, among others: stained-glass windows for the Metz Cathedral (1968), the United Nations in New York(1964), the Reims Cathedral (1974). In 1962, stained-glass windows were installed in the synagogue belonging to the Medical Center of the Hadassah-Hebrew University in Jerusalem. He also did large-scale paintings, including a part of the ceiling of the Paris Opéra (1964).